When an American accountant approaches Melbourne art teacher Kimberly Leamy out of the blue and tells her he believes she is Sammy Went, a child who was abducted as a two-year-old from her home in Manson, Kentucky, Kim believes this is a case of mistaken identity. But as she investigates her family, questions arise and she travels to Kentucky to find answers. Like the protagonist, this novel hits the ground running, then navigates multiple twists and turns before arriving at a tense and terrifying climax. 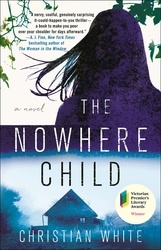 The Nowhere Child is a gripping, internationally bestselling, combustible mystery tale of kidnapping, family secrecy, and religious conspiracy, and is an unforgettable debut for author Christian White.